Microgaming, the world’s largest and top online casino gaming software provider, has revealed that its new online slot game titled ‘Ancient Fortunes: Zeus’ was made available exclusively for its operators on Wednesday, 10th April 2019. ‘Ancient Fortunes: Zeus’ is a 5 reel and 10 pay line slot game that has been developed exclusively by Triple Edge Studios, the creative team behind Book of Oz, taking players on a voyage to the mystical realm of Mount Olympus and coming with powerful gameplay mechanics. In the base game, colossal stone blocks embellished with hand-illustrated artwork reflect a pantheon of gods and mythological creatures, with Zeus appearing as a Wild and lightning bolts as Free Spin scatter symbols. 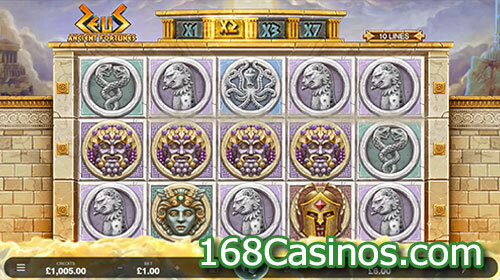 David Reynolds, Games Publisher at Microgaming, commented that Ancient Fortunes: Zeus is a striking Greek mythology themed slot, expertly crafted by the team at Triple Edge Studios. He added that combining the Rolling Reels mechanic with bidirectional pay lines gives the game an electrifying edge, amplified by a multiplier trail boosting potential wins. Reynolds added that the engaging free spins feature, which can be retriggered, sees the action and wins soar, with a maximum 21x multiplier, offering big win potential. Brendan Walton, Creative Design Lead at Triple Edge Studios, added that they are delighted to part the clouds to reveal Ancient Fortunes: Zeus, set in the rich and enchanting world of Greek myth. Walton also said that the king of gods and gold takes center stage in this premiere outing, featuring intricate hand-drawn artwork and an epic soundtrack that really brings the immersive realm of the gods to life.